Good location to restaurants and highway, easy on/off. Quiet even though faced the highway. Where to find Milford hotels near an airport? Where can I find hotels in Milford that are near tourist attractions? For those searching for a hotel or apartment near Milford, there are several options. Within easy driving distance of central Milford there are 7 Expedia-listed short-stay and long-stay accommodation options from which to choose. 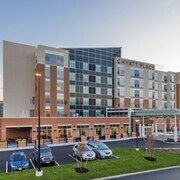 Accommodations that are within strolling distance of the Milford city center, are the Courtyard by Marriott Milford and Milford Inn. Milford offers just a handful of budget accommodation options. You will find the La Quinta Inn Boston - Milford located 3 kilometres (2 miles) from the center of town. 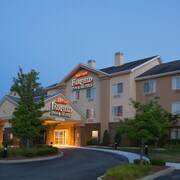 The Renaissance Boston Patriot Place Hotel can be found 20 kilometres (14 miles) away from the heart of Milford. Another hotel is the Beechwood Hotel, which is located 25 kilometres (15 miles) away. The Hotel Indigo Boston - Newton Riverside and the The Inn on the Horse Farm are some alternative options in Milford. If you are keen to see some more of the rural landscapes that feature in this area, you could also plan a few days in other destinations in Central Massachusetts. No matter if you engage in common regional activities, for example skiing, or tour around to see the sights you will be able to reserve comfortable accommodation in the area. 25 kilometres (16 miles) from Milford you will find Auburn, where you can enjoy Goddard Rocket Launching Site and Auburn Mall. Expedia-listed Auburn hotel options include the Fairfield Inn & Suites by Marriott Worcester Auburn and Hampton Inn Auburn. 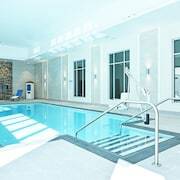 20 kilometres (13 miles) to the north of Milford, you may also choose to stay at Marlborough, home to the Embassy Suites Boston/Marlborough and Courtyard by Marriott Boston Marlborough. The Solomon Pond Mall and Spring Hill Cemetery are a couple of the most popular attractions to see for those visiting Marlborough. Just because you are traveling in Worcester, doesn't mean you can't indulge in your love of sporting events. You'll find Fenway Park 40 kilometres (25 miles) to the northeast of Milford. For tourists who are interested in booking accommodation close by, make a reservation in the Mandarin Oriental Boston or Four Seasons Hotel Boston. Logan International Airport is a convenient airport for flying into and leaving Milford. It is 45 kilometres (29 miles) drive away. If you would like to stay nearby, try the The Ritz-Carlton, Boston or Fifteen Beacon. What are the most popular Milford hotels? Are there hotels in other cities near Milford? What other types of accommodations are available in Milford? Explore Milford with Expedia.ca’s Travel Guides to find the best flights, cars, holiday packages and more!